In the run up to International Women’s Day on March 8 we aim to publish a number of articles on women’s resistance internationally. Farooq Sulehria interviewed Feminist and revolutionary Ahlem Belhadj for the Swedish feminist magazine Feministiskt Perspektiv. “I can claim that the democratic transition in Tunisia was possible also because the feminist movement in the country was strong”, says Ahlem Belhadj. Five years has gone since January 2011 and the popular uprising in Tunisia which inspired the Arab Spring. Ahlem Belhadi, a specialist in child psychiatry, is a leading figure in the Tunisian feminist movement. Described as the ‘Arab Spring’s Tunisian Heroine’ and winner of the Simone de Beauvoir Award in 2012, she was the chairperson of Tunisian Association of Democratic Women (2011-13). – Tunis is viewed as the only success story of the Arab Spring. The country witnessed not only a transition to democracy, but also the approval of a secular constitution. How correct is this mainstream impression outside of Tunisia, especially from the viewpoints of women? – Tunis is going through a process of change. Of course, we have had some successes. The fact that free and fair elections have been held twice in five years is one such victory. In 2010, nobody in Tunisia could even imagine free elections in our country. Yet in 2011, Tunisia elected a Constitutional Assembly (to draft the constitution) and in 2014, a democratic government was elected. Another victory is the right to freedom of expression and to associate freely. – Most importantly, we have a constitution. The constitution was drafted following a very important social debate. Though the constitution may not yet claim to be ideal it is not a bad constitution either given the fact that Islamists enjoyed a majority in the Constitutional Assembly (elected in 2011). The most important aspect of the constitution is that it is not based on Sharia. However, Article 1 is problematic. – While Tunisia is acknowledged to be free and democratic, according to this Article, Islam has been declared as the religion of the country. This can be misinterpreted. It is not clear whether Islam is the religion of the state or the society. At the same time, on the positive side, there is a commitment to universal human rights. Regarding women, there are many achievements. Not only have women been acknowledged as equal, there is a commitment to empower women politically and to end domestic violence. Also, there is a constitutional mandate for parity in the election lists: every party is obliged to field 50 procent women in elections. But at the same time, many freedoms and rights Tunisian women enjoyed under the Ben Ali dictatorship are now threatened. For instance, fundamentalists want to legalize polygamy. Social conservatism and puritan violence is on the rise. How would you draw the balance sheet on the fifth anniversary of the Arab Spring? – When we talk about success, we do not imply a complete and total success. The success is only relative to other Arab countries. We are still fighting for the principles that animated and inspired the revolution. Until now, many tasks of the revolution remain unfulfilled. The old regime is still there. Institutions of violence are yet to be re-structured. There is a big economic crisis. Terrorism is raising its head while social justice remains elusive. – Regarding women rights, I would claim that these are linked generally to overall political and social rights. 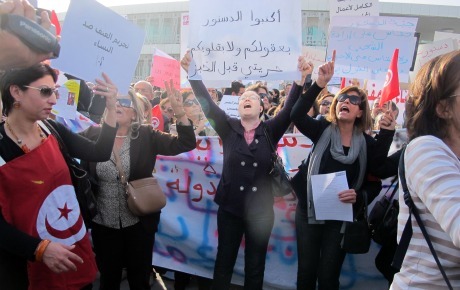 The Tunisian women’s movement has always stressed that you cannot have increased rights for women in the absence of democratic rights, social justice and liberty for all. The Tunisian revolution has vindicated this position. – For instance, after the revolution, the process of drafting the constitution was an interesting lesson in this regard. It triggered a social debate about women rights. It was a widespread social debate involving large sections of the citizenry. One important outcome of the debate was evidence that a large majority wanted to uphold equality for women. Another important aspect of this entire process and debate was the defeat of Islamists in the 2014 general elections. More than one million women voted against them because of their position on women rights. 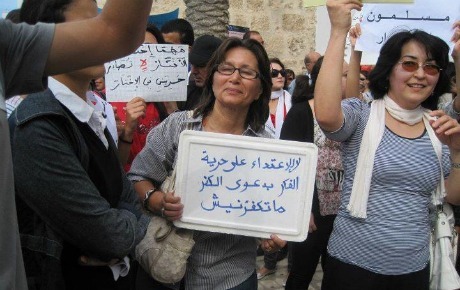 – Tunisian feminists have a long way to go and there are many important tasks before us. The old laws kowtow to the newly drafted constitution and indeed many are discriminatory. Some other Arab countries have better legislation on women rights than Tunisia. Then there is feminization of poverty. Violence against women is another huge challenge. Terrorism is posing new threat to women’s sense of security. In the wake of the Arab Spring violence against women has assumed new forms and grown phenomenally. Likewise, electoral victories for fundamentalists in the Muslim countries pose new threats to women when democratic freedoms are won. Do you think this situation validates the argument, that in the Muslim world women rights have been better protected under ‘modernist’ dictatorships? Once can cite the case of Iran under the Shah, Tunisia up until 2010 and couple of military dictatorships in Pakistan. Your comments? – This bi-polarity is a fake one. I think, we always had the possibility to say: Neither dictatorship, nor Islamic fundamentalists. The feminist fight in the Muslim world should be to have democratic governments that respect the rights of women. Likewise, Islamists, even the moderate ones, cannot respect women’s rights. They cannot adequately respond to women demands. The case of Tunisian feminists demonstrates that it is possible to fight back against dictatorships as well as against Islamists. We were against Ben Ali and we have resisted the Islamists. After the revolution, feminists demanded democracy even if it brings Islamists to power. We have to fight the Islamists through democratic means. Our struggle shows that it is possible. I can claim that the democratic transition in Tunisia was possible also because the feminist movement in the country was strong. – In fact, if the feminist movement is the motor of social change it enables progressive forces to defeat all the exploitative forces. Feminism attacks patriarchy that divides society on the basis of gender. As well it attacks capitalism that divides people into dominant and dominated. What about the Muslim countries where the feminist movement is fragile and marginalized? For instance, Saudi Arabia or Afghanistan where most women cannot even step outside of their homes? – I think the feminist movements have to build themselves so that they are not as small as they are presently in some of the Muslim countries. That is the only solution. How to do that? There are no shortcuts or simple answers. However, the Tunisian lesson is that feminist movements in Muslim countries have to link themselves with broad movements for social justice. Feminists need to engage with the climate question, trade union struggles, rights for oppressed people such as gays and lesbians and so on. In this way, you pose the women question to the entire society: political parties, unions, associations, and work places. – In Tunisia, because of Ben Ali, the women’s movement was small. In the Tunisian General Labour Union, or UGTT (Tunisian LO), women constitute more than 50% of the membership. They have led countless struggles from the UGTT platform. The feminist movement was not acting in solidarity with UGTT. On the contrary, women were an integral part of UGTT. Can Tunisia be an example to emulate in Muslim countries like Saudi Arabia where the social and political atmosphere is very different? – In 2011, when the international community noticed the presence of women in Arab Spring, not just in Tunisia and Egypt, but everywhere, they were surprised. Prior to the Arab Spring, it was thought that there was no women’s movement in the region. The Arab Spring proved this assumption wrong. Reality is complex. In the last decade or so, the situation of women has changed in the region. There is a new generation of women fighting for their rights and employing new tools to engage in various struggles. This is true even in Saudi Arabia. It is true that in Saudi society, women are often engaged in struggles to win small symbolic gains and rights. One may not agree with them either. Nonetheless, they are engaged in fighting. More and more women in the Arab world refuse to accept their subjugation. The Arab Spring has catalyzed this process. But one may also point out that the processes unleashed by Arab Spring have also brought catastrophe upon Arab women. While violence is one form, displacements as a result of conflicts such as in Syria, have exposed women to sexual exploitation, physical insecurity, child marriage and what not. What are your comments? – Violence against Arab women is not new. But the level of this violence was never as high as it has been in the wake of Arab Spring. We can explain it in at least two ways (perhaps more). Firstly, when stability is lacking and armed civil strife is raging, there is a hike in the level of general violence. Particularly violence against women increases manifold in conflict-zones. – Secondly, violence is a tool to prevent and control women’s participation in public and political spheres. As we know, women actively participated in the Arab Spring. Many resisted this participation, even in Egypt and Tunisia. Violence is often employed to resist the change ushered in by women’s participation. In a way, this violence indicates that women are asserting themselves. However, this does not in any way mean that I am condoning this violence. – At the same time, let me point out that this violence against women has also invoked an outrage. In some Arab countries, new legislation has been either introduced or is being introduced to curb violence against women. Again, these legislative initiatives are largely responses to women’s demands for their rights. Egypt introduced new legislation against sexual harassment and a year ago Lebanon introduced new laws against domestic violence. Algeria and Tunis have also seen attempts to create legislation to end women-specific violence. The rights won by Tunisian movements constitute a curious case owing to Islamic fundamentalists’ majority in the Constituent Assembly. How did feminists deal with them during the process of drafting the constitution? – (Laughs). We adopted many strategies. One was to engage them in debates. We convinced them. Many Islamists voted with us. For instance, on the question of parity, Islamists voted with us. Initially, they were not in favour of parity. However, when Islamists refused to accept our demands, we would take to streets and hold demonstrations against them. How do Islamists recruit and organize women? How as feminists do you counter their strategies to win over women’s support? – Initially, the Islamists did not have any organized structures in their parties to recruit or organize women. After the revolution, hundreds of women’s organizations were formed to organize women. Some of these organizations are linked to Islamist parties. A few of them are also talking about Islamic feminism. However, these Islamic feminists are not yet as well elaborated as their counterparts in Morocco, Malaysia or Egypt. They have not been very successful thus far. – Our main difference with Islamists is on the question of equality. They agree on equality for women in the public sphere, but in the domestic realm they emphasize the Islamic principle of ‘Qawama’. By Qawama, they imply specific roles for men and women as prescribed in Sharia. They claim that men are the heads of the families according to Sharia. Likewise, in the name of Sharia, they oppose equal inheritance for women. How do you counter their arguments when they quote Sharia as an argument? – Sometimes we resort to alternative interpretations of Quran. In some cases, we refer to universal right to equality and international norms. What about the young women? Are they also engaged in the struggles? – Young women are actively engaged on many fronts. Many of them are engaged in the movement for transitional justice. They are campaigning against reconciliation with the old regime. They want justice for the victims of old regime. Another important struggle involving young women is LGBT rights. They are demanding more individual rights. But they are also engaged in broad struggles for economic rights and employment. What were the major achievements in 2015? 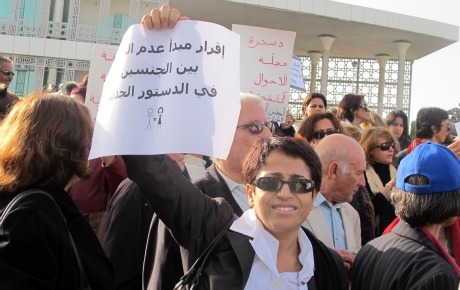 What will be the major goals in 2016 for Tunisian feminists? – A long drawn out fight for legislation against domestic violence is likely to come to fruition in 2016. If one goes by the Ministry of Women Affairs, we will have a women-friendly law against domestic violence in March 2016. – In 2015, there was a small but symbolic victory to have some amendments facilitating international travel for women. Earlier, women needed the consent of husband to have their own and children’s passports. They do not need this permission anymore. However, we have a long way to go as I have mentioned earlier. A long-term struggle is to have Tunisian laws conform to the constitution. What is your New Year message for Feministiskt Perspektiv? – I have met Feministiskt Perspektiv before. Knowing know that there are feminists in other countries interested in the struggle of Tunisian feminists is reassuring. International solidarity is always encouraging. One feels that one is not alone. While we perhaps face different problems, victories for Swedish feminists are considered victories for Tunisian women too. – One also wishes to have a paper like Feministiskt Perspektiv in Tunisia. In fact, we had a feminist paper in the 1980s, called ‘Nisa’ (Women).